Baby, It’s Cold Outside | The Happy Wonderer ~ ellen b. We had a nice lunch and visit with our oldest kids this afternoon. Josh helped his dad with a two man project for an hour after lunch. Then we got a hail/snow storm later in the afternoon that made a mess of the roads. We now have a new layer of white on our grass and deck. I’ve overloaded my capacity for creativity with a project I’m keen to get done this week. This creative venture is a gift so I can’t share it till it’s given away. In the meantime things will be sporadic on my blog. Hope all is well with my bloggy friends. Looking forward to the month of March. 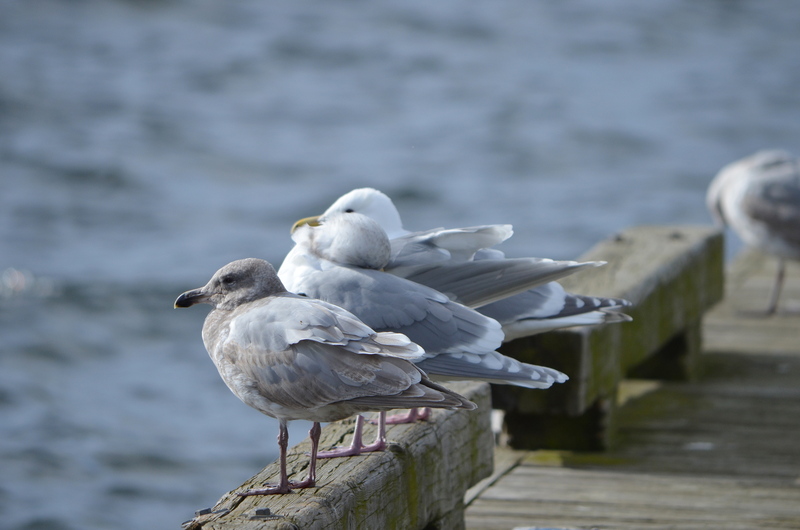 Posted on February 25, 2018 by Ellen •	This entry was posted in Birds, Winter and tagged Kirkland Waterfront, Seagulls. Bookmark the permalink. …baby, it’s warm over here. Hello, stay warm and safe. Family time is always wonderful. I hope you have a great day and a happy new week ahead! It is cold! I’m ready for warmer temperatures. Good luck with the creative project. Huddling like the gulls to keep warm is still a must as we are experiencing a Siberian blast this week! Today has been odd …. driving from sun to snow squalls and back to sun again. But, as you know, we love the snow, so bring it on!!! Good luck with your project – look forward to seeing it when you can show us! I meant the last few days, those darn typos! I love when we can meet up with the kids.